For shoppers looking to streamline the process and make replenishing household consumables as easy as possible, Amazon Dash buttons are the way to go. These programmable, branded buttons are Wi-Fi enabled and linked to a user’s AMZN account, and when pressed, they will initiate a new purchase of the designated product. With more than 100 branded Dash buttons available for the most common household names, Amazon has made it easier than ever to make sure you never run out of an important product. Of course, the idea isn’t that you should buy a Dash button for every single product in your house — although you could, if you wanted to — but rather for the handful of items that are most frequently forgotten, such as trash bags, laundry detergent and toilet paper. With the help of an app called Flow, you can add items to your Amazon shopping list simply by using the camera in your iPhone or Android smartphone. Flow continuously scans everything seen by the camera lens and searches for a match among AMZN’s tens of millions of product images. Flow uses augmented reality to show users a product’s price and reviews on the screen as it overlays the camera image. Recent updates have added improved text recognition for saving additional information from books, business cards and signs. For many shoppers, especially those purchasing expensive luxury items, the thought of a package just sitting on the doorstep all day is cause for concern. Well, thanks to Amazon Locker, the problem of unattended packages is quickly becoming outdated. 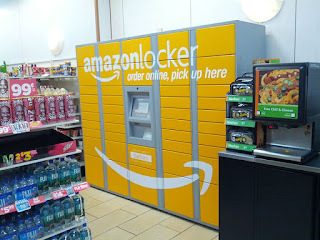 Amazon Lockers are large, yellow container systems that can serve as delivery destinations for items purchased on the AMZN website. When packages are delivered to the locker, buyers receive an email notification with a barcode and other specific information. Using the barcode, items can be picked up at a time that’s convenient for buyers, with no concerns about theft, damage or misplaced packages. 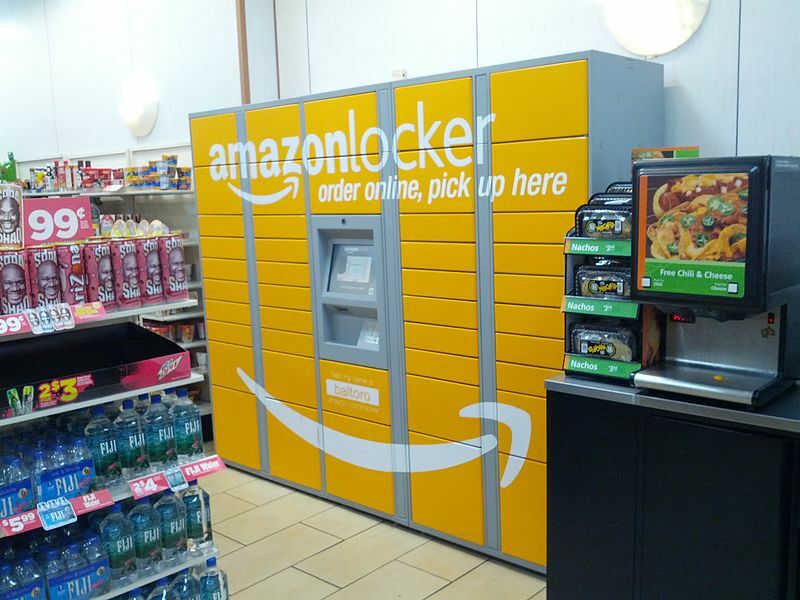 Amazon Lockers are already in a number of cities throughout the U.S. and Europe, and more are appearing as the option increases in popularity. Perhaps the most philanthropic, yet least well-known demonstration from AMZN is the AmazonSmile program. With as little effort as possible — literally, this requires simply typing the word “smile” — every purchase made on Amazon.com will result in a portion of the total purchase price being donated to the charity of your choice. Users may choose from a list of nearly 1 million registered charities, and may change their selection at any time. There is no difference or increase in product prices when shopping with AmazonSmile, and there is no cost for users to participate, so there’s really no reason not to shop with Smile.Amazon.com. Perhaps the most relevant and important aspect to feeling comfortable making a purchase through AMZN is the depth, scope and number of reviews for a particular product. Reading real feedback from actual humans who have previously purchased an item you are considering buying is in many ways more valuable — and sometimes more trustworthy — than the company’s description of its features. To that end, Amazon encourages shoppers to leave reviews and share feedback about products they’ve purchased. Members with a reputation for providing a large number of high-quality reviews are sometimes invited to join the elusive and coveted Amazon Vine program. Members of the program are provided with free products from vendors in exchange for a comprehensive, honest, unbiased review after a period of examination and use. Many of the products provided for review are pre-release versions, meaning Amazon Vine members get early access before the general public. One of the lesser-known offerings from Amazon is called Mechanical Turk, which is an online marketplace for businesses and workers to connect. But, it’s not a job search site, nor a typical freelance marketplace, either. Instead, Mechanical Turk is a platform where businesses can set up “Human Intelligence Tasks” for the workforce to complete. Workers can examine the list of available tasks and choose to complete any that interest them. Using this method, businesses can harness a significant workforce to complete basic tasks quickly. Payment for finished tasks on Mechanical Turk is usually quite small, with some tasks paying less than 10 cents apiece. So, the reward for completing tasks is laughably tiny, but also in-line with the complexity of the job. Workers who are able to perform quickly, and who can get into a steady rhythm, have the ability to earn noticeable extra income with relatively minimal effort. In October 2013, Amazon successfully formed a Negotiated Service Agreement with the U.S. Post Office to deliver select AMZN packages on Sundays. Of course, there’s an additional cost for Sunday delivery, but the option is attractive enough and used often enough by shoppers to make the arrangement worthwhile for Amazon.